"I was in the occupied territory, and quite recently." MP Nadezhda Savchenko (Fatherland) admitted that she has recently went to the occupied Donbas. "For anyone who wants to understand what's going on in the Donbas: I was on the occupied territory, and quite recently. and talked with the people who have held me captive. People understood what Russia is and who they are dealing with. 70% of the people regret that they took up arms, they would like to return to Ukraine," Savchenko said on Thursday, 13 October, at the session of the Parliamentary Assembly of the Council of Europe. Just five days prior, Savchenko said that was in the zone of the ATO, but made no attempts to get into the occupied territory. Before that, the editor of the News of Donbass Oleksiy Matsuka said that Nadiya Savchenko tried to get to Donetsk by trails through Krasnohorivka to meet with Zakharchenko, but she was not allowed to by the Ukrainian military. 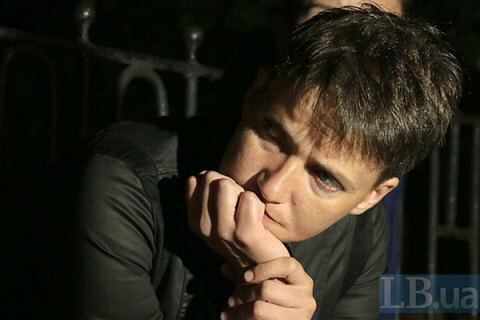 In early September, Savchenko talked about intentions to go to the territory controlled by the Donetsk and Luhansk "republics" and negotiate with their leaders.